Chances are pretty good you have seen this attractive foliage plant at nursery centers. 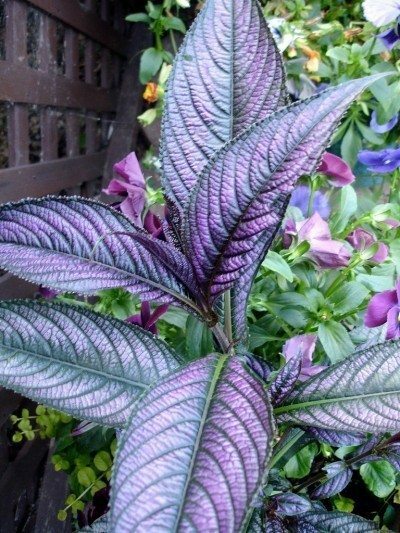 The bright leaves of the Persian shield plant (Strobilanthes dyerianus) are almost better than a flowering specimen since they provide stunning color year around. Growing Persian shield requires warm temperatures and sultry humid air. It is hardy in USDA zones 8 to 11, but is more commonly grown indoors or as a summer annual in cooler climates. Use Persian shield indoors to brighten up the home and create tropical ambiance with ease of care. Persian shield is a phenomenal foliar specimen. It produces 4- to 7-inch long, slender leaves tipped with a point. 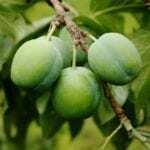 They are slightly serrated and have deep green veins with purple to silver on the entire surface of the leaf. The plant has a bushy habit and may get up to 4 feet tall in habitat. Because it is only suitable for USDA zone 10, growing Persian shield indoors is the best way for most gardeners to enjoy this brilliant plant. 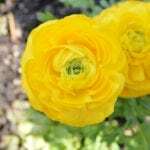 You can put the plant outside in summer, but make sure you bring it back inside before cold weather threatens and you may be rewarded with slender spiky flowers. The plant performs well in a container inside or outside, in full sun to partial shade. Provide even moisture and high humidity. The best way to give extra humidity to a Persian shield indoors is to place a thin layer of rocks in a saucer and balance the pot on top. Keep the saucer full of water. This keeps the roots out of the water but the evaporation of the water provides higher humidity to the air. You can grow Persian shield outdoors in warm climates and plant them in the ground as part of a border display. In cool zones, however, treat the plant as an annual or bring it inside at the end of summer. You can share this lovely plant easily with friends and family. Persian shield propagation is done through seed or cuttings. Take 2- to 3-inch sections from the tips of the plant, cutting just below a growth node. Strip the bottom leaves off and insert the cutting into a non-soil medium such as peat. Mist the medium and place a bag over the cutting. Remove the bag for one hour daily to keep the cutting from molding. In a couple of weeks, the cutting will produce roots and you can replant it in potting mixture. Persian shield is an easy to care for plant. Pinch the stems back to force bushiness. Water the plant when the top couple of inches of soil are dry and keep a bit drier in winter. Fertilization is one of the most important Persian shield care instructions, especially for potted plants. Feed every two weeks with a half dilution of liquid plant food. Suspend feeding in fall and winter. Watch for mites and soil gnats. You can combat these with horticultural soap and by changing the soil. Read more articles about Persian Shield Plants.